LONDON—Ballet is a curious art form. Where else would we accept as standard a work by a number of different hands, based on the artist’s original? Just think how art historians obsess over whether a painting is by an artist, attributed to him, or by his studio. In music, the process is accepted to a limited extent; just think of Luigi Cherubini’s “Medea,” where the recitatives are by another composer. The fact is that until the invention of accurate choreographic notation, ballets relied on memory to be transmitted, and it was accepted that new generations would change and improve them. These thoughts occurred to me as we watched the recent revival of the 19th-century Russian ballet “La Bayadère” by The Royal Ballet at the Royal Opera House. The production is billed as conceived and directed by Natalia Makarova, with choreography by Natalia Makarova after Marius Petipa, with music by Ludwig Minkus orchestrated by John Lanchbery. Actually, though, the work’s heritage is more complicated than that. Petipa first mounted “La Bayadère” in 1877, and the final production that he supervised was in 1900, which was recorded in the Stepanov notation (a 19th-century choreographic notation system that, if imperfect, nonetheless allows us access to some of the choreographer’s original thoughts). But all modern productions of the ballet derive from the Soviet Kirov Ballet’s 1941 staging, which severely trimmed the ballet and reduced it to three acts from four, repurposing Petipa’s “Grand pas d’action” from the last act (of which he was very proud) to earlier in the ballet. Even before 1941, details were changed by great dancers associated with the roles, and some of these changes became accepted as writ, a part of the standard ballet. Natalia Makarova danced in the Kirov version as a young dancer, and so based her version on it. Similarly Rudolf Nureyev mounted his version of “La Bayadère” for the Paris Opera in 1991, and his has similar origins. So why bother with the ballet at all? 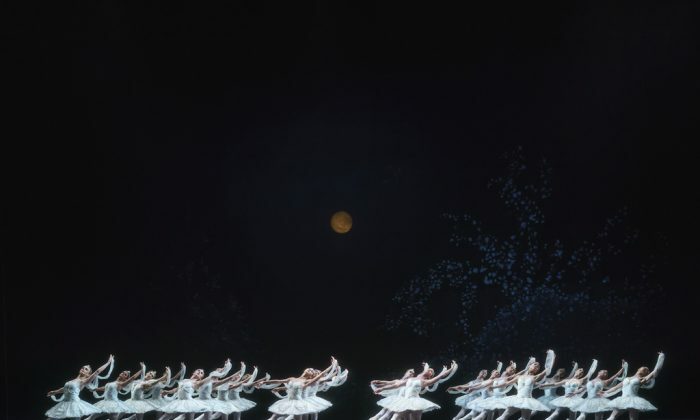 Well, “La Bayadère” contains one of the greatest scenes of 19th-century Russian ballet, the “Kingdom of the Shades” scene, a scene so influential that it was often given alone. Before The Royal Ballet took on Natalia Makarova’s production in 1989, it played Nureyev’s version of the “Kingdom of the Shades” scene as a stand-alone ballet, first mounted in 1963 and last given in 1985 when I saw it. In the scene, Solor, having smoked opium, imagines himself in the afterlife having followed his deceased beloved Nikiya. The shades or spirits of 24 women appear and dance, and then he dances with the shade of his beloved. In Petipa’s original, there were first 36 and then 48 shades. (I have seen 36, but The Royal Ballet currently uses just 24.) Each dancer enters one after the other, doing the same gestures, descending a ramp, slowly, until the stage is filled with the 24/36/48 women all doing the same thing. Then they go into formation and we are securely in “Swan Lake” territory. It is a mesmerizing scene, a technical feat that acquires its magic from the sheer perfection of technique. Like minimalism, the dance requires the individual gestures to be coordinated and not display noticeable individually. It is the whole that counts. The ballet does not have quite the emotional pull of “Swan Lake” because it is less of a gesamkunstwerk. The music by Ludwig Minkus is more functional than Tchaikovsky’s for “Swan Lake” and “Sleeping Beauty” and has less emotional pull. But Minkus’s music is not simplistic. He wrote to Petipa’s detailed specification, as did Tchaikovsky in “Sleeping Beauty,” whereas “Swan Lake” was only choreographed by Petipa after Tchaikovsky’s death. But the rest of the ballet makes clear just what a difference great music can make. In many ways, the plot has similarities to that of “Swan Lake”: a prince involved with an unsuitable woman, a good girl and a bad girl, a lover who is not entirely human (Nikiya in “La Bayadère” spends half the ballet dead, as a shade). 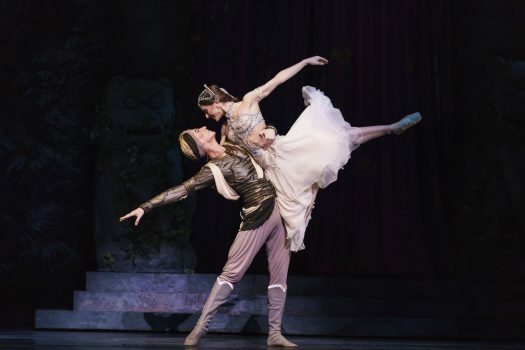 But in “La Bayadère,” it is the choreography only that interests us; Minkus’s music, charming though it is, is just the harness. The Royal Ballet production uses John Lanchbery’s orchestrations, so I don’t know how much would be revealed by going back to Minkus’s original, which was only rediscovered in the Mariinsky Theatre’s music archives as part of Sergei Vikharev’s reconstruction of Petipa’s original, complete with the missing last act. Certainly, it would change the character of the piece. My memory is a little hazy about the production the Kirov brought to London, but it felt more like a dramatized historical romance and less like a simple container for “The Kingdom of the Shades” scene, which is what Makarova’s production feels like. In many ways, reconstruction of the original ballet is impossible. Petipa’s dancers were generally shorter and dumpier than today’s slim, willowy ballerinas. Try to imagine Petipa’s choreography danced by shorter, thicker legs and arms. The results would probably have had a vigor and a robustness that modern classical ballet does not. There is another problem, too, with whichever version we use. The ballet uses a very 19th-century Orientalism as its worldview, with an Indian setting complete with semi-comic dancing fakirs. The sheer beauty of The Royal Ballet’s sets and costumes (by Pier Luigi Samaritani and Yolanda Sonnabend) make it work, and we have to accept that the cultural appropriation of 19th-century Orientalism is part of Western culture. But still, those dancing fakirs do rather grate. Tristan Dyer did what he could with the Head Fakir, dancing the role with great skill and immense conviction, despite a profoundly dodgy costume. Sarah Lamb was a wonderfully languid and lyrical Nikiya, with Ryoichi Hirano as a fine, upstanding Solor, a role that is the equivalent of the nice but dim tenor hero. He partners wonderfully but lacks the common sense to actually stand up to the Rajah. This latter role, nobly played by Bennet Gartside, is little more than a cypher and woefully underwritten. It is the “bad girl” role of Gamzatti that stands out, and Claire Calvert made a terrific Gamzatti, making every gesture of mime count. The production works, just about, with some suspension of disbelief, and having the “Kingdom of the Shades” in the repertoire is as essential as “Swan Lake.” But I can’t help feeling that that reconstruction of the 1900 production would be worth investigating. Robert Hugill is a composer, lecturer, journalist, and classical music blogger. He runs the classical music blog Planet Hugill, writes for the Opera Today website, and Opera Today and Opera magazines. He lectures and gives pre-concert talks on opera and classical music in London. As a composer, his disc of songs “Quickening” was issued by Navona Records in 2017. This article, slightly edited, is reprinted with permission from Planet Hugill.